Beth, of BlueValentinePress.Etsy.com submitted this book for our book swap. 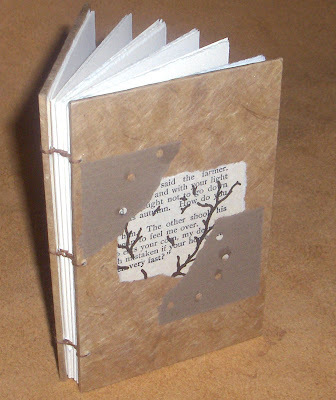 It features a unique mini collage on the front cover. The collage includes a gocco print, some reclaimed text and other torn papers that have holes made using a Japanese hole punch. 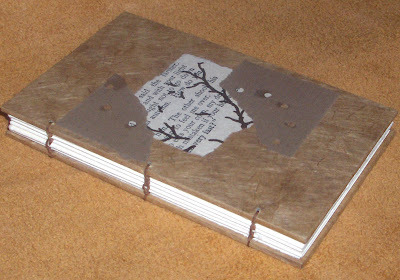 The lovely pocket-sized book is bound with an exposed chain stitch sewing. Visit BlueValentinePress's Etsy shop to see more of her work. hey hey! i got that book! and i've already used it, too. what kind of paper is that, by the way? because it rocks. I'm glad you like it and are using it! I think you mean the inside pages paper and that's Mohawk Super Fine Smooth -it does rock, takes ink, pencil, and glue like a champ! This is beautiful! I love collage pieces and earth tones--great combination.